The Article: I risked my life to pay off $108,000 in student loans by Jennifer Liberto in CNN Money. The Text: Thomas McGregor risked his life to pay off his student loans. McGregor graduated in 2008 from the University of St. Thomas law school in Minnesota with $108,000 in student loans. After several months of job hunting, and with the threat of a deeper recession looming, McGregor decided to enlist in the Army. McGregor knew what he was getting into. When he joined, he was told there was a “100% chance” he’d be deployed overseas. He deployed to Iraq for two months in 2010, and later to Afghanistan from May 2012 to March 2013. His first convoy in Iraq was attacked by an RKG-3, a Russian anti-tank hand grenade. He and his colleagues were regularly fired upon in Afghanistan. One of his buddies lost his legs to land mines. He also lost friends in Afghanistan. By all accounts, McGregor did things backwards. Most people join the military first, usually after high school, and then go to school. The GI bill picks up most of the tab for veterans who attend public universities and up to $17,500 for those at private colleges. 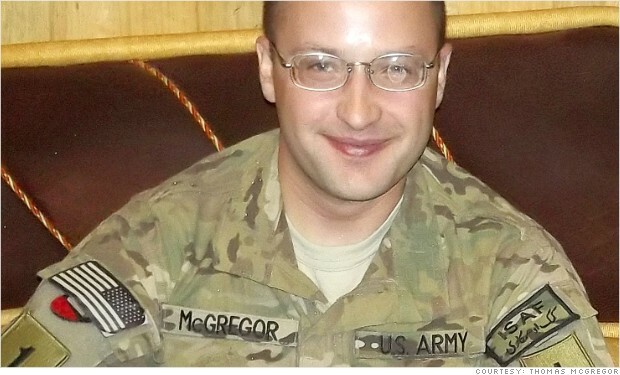 McGregor graduated from law school in May 2008, passed the Minnesota state bar and was sworn in as an attorney in late October. He was convinced he’d get a “good job right away,” circulating his resume and taking an unpaid internship at a legal aid clinic. Later that year, he went back to work for his family’s roofing distribution business, where he had worked every summer for 13 years. He was licensed to practice law, but he was driving a forklift and managing roofing material orders for $15 an hour, no benefits. “I’d load up the pick-up truck or unload returns, it was pretty much manual labor,” he said. And his $1,200 a month student loan bills began to pile up. McGregor decided to enlist after seeing the recruitment incentives. He started training in February 2009 and later went to Officer Candidate School, which allowed him to earn a higher Army salary. McGregor was able to trim his private loan interest rates to 6% with the help of the Soldier Relief Act, which caps interest rates while soldiers serve. And the Army College Loan Repayment Program paid down $65,000 of his loans. The rest he paid off just using his Army salary. He was free of debt by 2012. “You don’t have any bills when you’re deployed,” he said. He was only required to be active in the Army three years, but he liked it so much that he stayed. When he leaves the Army, he’ll be subject to be recalled for eight years, if the Army needs him. He said he has no regrets.